The rest of the cryptocurrency market including major crypto assets such as Litecoin and Ethereum recorded large gains against the U.S. dollar with the momentum established by bitcoin. BITCOIN NEEDS FUEL TO MOVE OUT OF $5,000 TO $6,000 RANGE, WILL CME BE THAT FUEL? 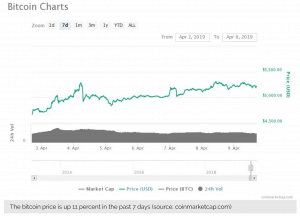 On April 1, various technical factors supported the upside movement of bitcoin and enabled the dominant cryptocurrency to spike by 20 percent as soon as it broke out of an important resistance level at $4,200. Some traders were cautious in the ability of bitcoin to break out of the $5,000 to $6,000 range because it would require strong stimuli to push the asset above that range, similar to how a $100 million buy order and a $500 million shorts liquidation pushed BTC earlier this week. In the near-term, if the volume of the CME bitcoin futures market can be sustained, there is a high probability that the bitcoin futures market could serve as the catalyst of the next bitcoin movement. On Tuesday, CME reportedly told Bloomberg that 22,542 bitcoin contracts were traded, worth about $546 million. Interestingly, most of the volume came during Asia hours, more than half of the daily volume. “CME Bitcoin futures hit a record 22,542 contracts traded on April 4, equivalent to 112,710 Bitcoin with a notional value of $546 million, according to a release from the derivatives exchange operator. A majority of the trading volume on that day came in Asia hours with 12,634 contracts traded, CME said,” the Bloomberg report read. Trades processed during Asia hours does not necessarily translate to buyers in Asia purchasing bitcoin futures contracts but it significantly increases the likelihood of the buyers being based in major cryptocurrency markets in Asia such as Japan and South Korea. Previously, the bitcoin futures market volume was disregarded by many because of the inflated volume of the cryptocurrency exchange market. From March 4 to March 8, CME and CBOE are said to have recorded a volume of over $91 million. 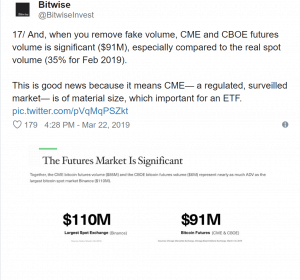 The $546 million volume of CME on April 4 dwarfs the 4-day volume recorded in early March and it demonstrates a striking rise in demand for BTC in a short time frame. Bitwise also reported that from March 4 to March 8, the total BTC spot volume across all exchanges was $273 million. That is exactly half of the volume recorded by CME on a single day. Whether the volume of the CME bitcoin futures market will be sustained over the medium-term or decline following its initial spike on April 4 remains an uncertainty. But, it could serve as a catalyst for the next movement of BTC as the $500 million liquidation of short contracts pushed bitcoin further up on April 1.